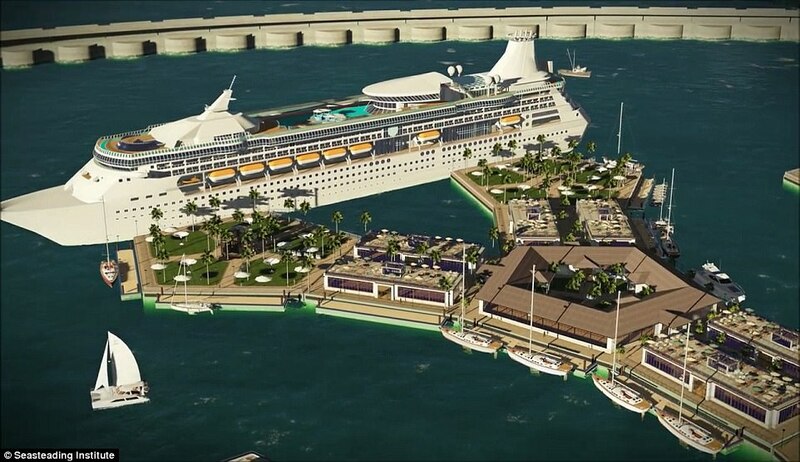 Stunning concept images for the world's first first floating nation have been released as part of a project bankrolled by PayPal founder Peter Thiel. 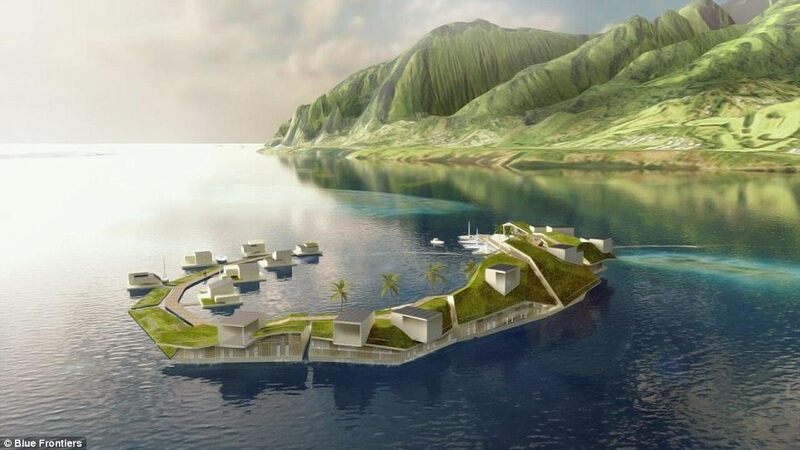 The plans will see the seabound city-state, complete with a handful of hotels, homes, offices, restaurants and more, built in the Pacific Ocean off the island of Tahiti in 2020. Now, a series of computer generated graphics reveal how it might look once complete, with a design that blends futuristic technology with Polynesian traditions. 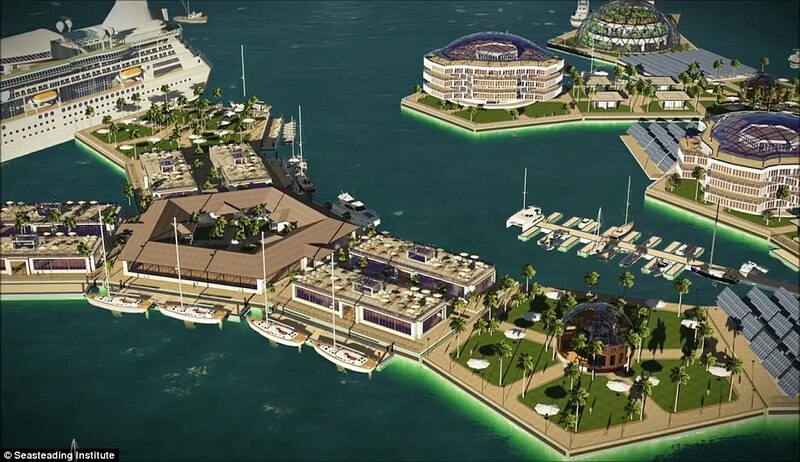 The scheme is the creation of the nonprofit Seasteading Institute, which hopes to 'liberate humanity from politicians'. The radical plans could see the creation of an independent nation that will float in international waters and operate within its own laws. 'Seasteading' has long been the stuff of science fiction, drawing comparisons with the post-apocalyptic Kevin Costner movie Waterworld. 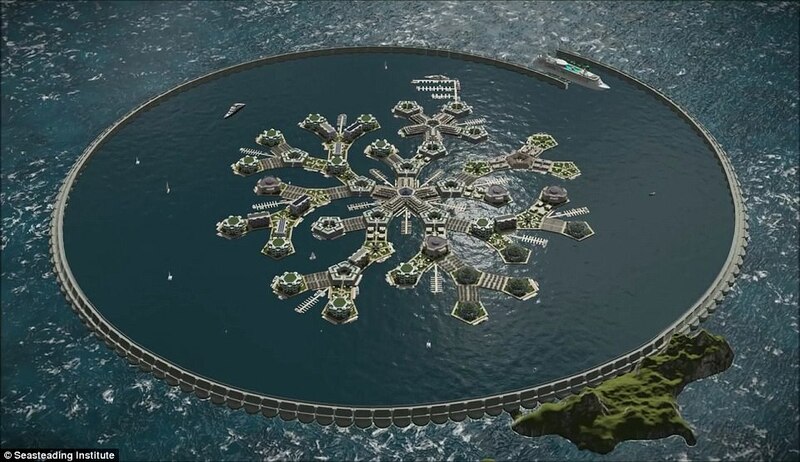 But the fantasy looks to be coming closer to reality with companies, academics and architects from the Seasteading Institute working on a prototype for construction at the turn of the next decade. The latest concept images take inspiration from the rich Polynesian culture, in particular from traditional navigation, which is based on the observation and knowledge of natural elements. 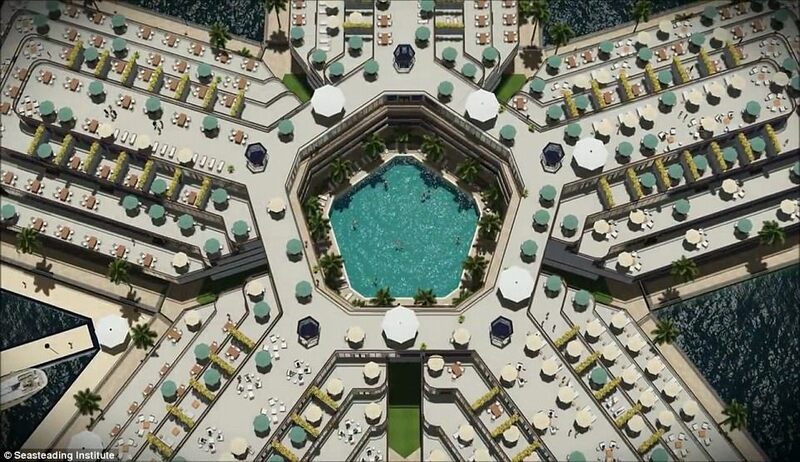 In a written statement, a spokesman for the Seasteading Institute said: 'During several visits to French Polynesia and after getting acquainted with the environment and the local contexts, one thing was sure, the project has to blend into its environment. 'To achieve this, local environmental characteristics, climate, ecology and cultural context have all been studied and play a major role in the process. The overall shape of the construction reflects the pattern of a fish hook, an ancestral tool that symbolises the actions of the demigod Maui. Hills and mountains, the shape of reefs and other underwater landmarks, as well as the rising and setting of the sun, moon and stars are reflected in the design. Small platforms with villas are aligned to the path of the stars of the Sirius, or Rua faupapa, star system. 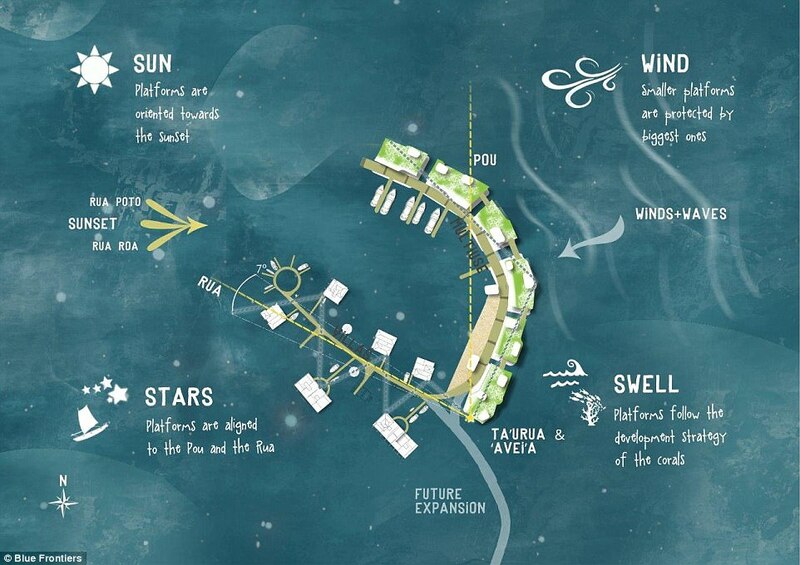 Larger platforms with mixed-use buildings are aligned to the celestial pillar Pou, starting from the main platform, the 'star headlight' or Ta’urua, and ending by the guide star Avei’a, passing through the zenith of the floating island. Other elements of navigation are taken into account in the urban planning. 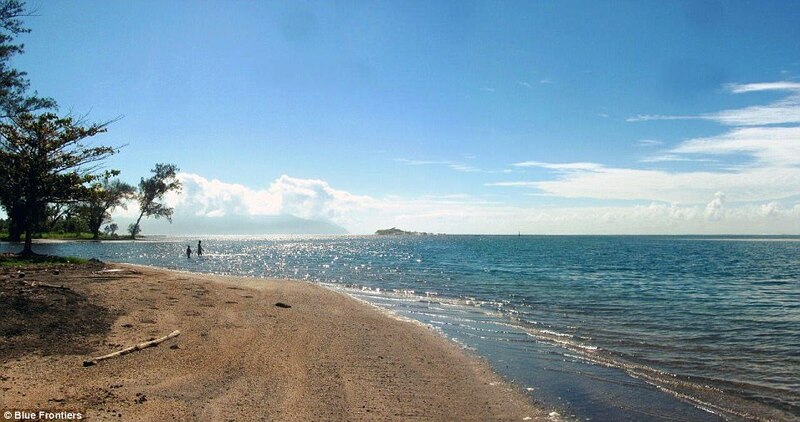 The larger platforms are oriented according to the prevailing wind direction, in order to create calmer wave conditions behind them. 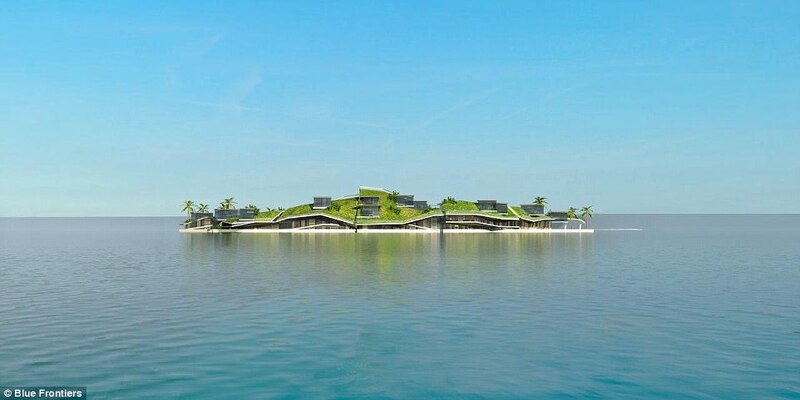 The project aims at including Polynesian culture also in the design and detailing of buildings and other structures. 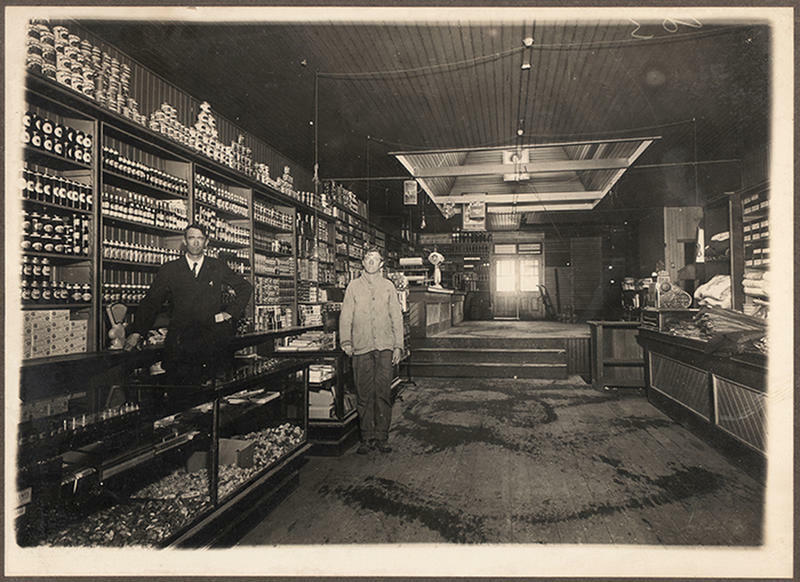 Local construction techniques and materials are blended with modern technologies to fulfil contemporary needs while preserving continuity with tradition. 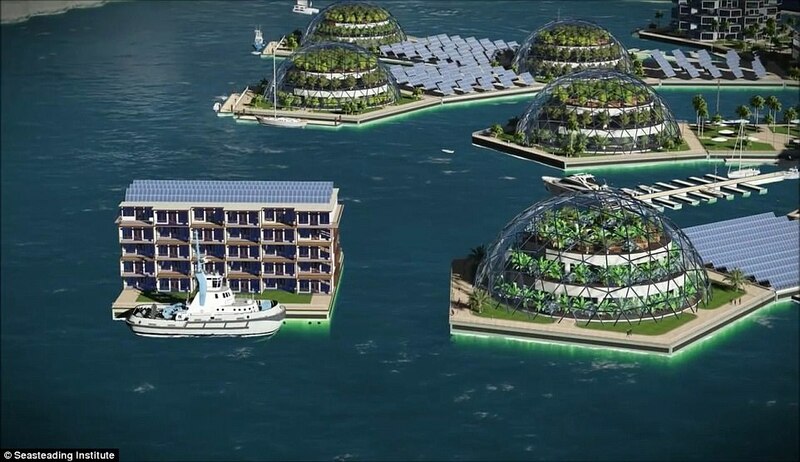 In an interview in November, Joe Quirk, president of the Seasteading Institute, said he wants to see 'thousands' of rogue floating cities by 2050, each of them 'offering different ways of governance'. 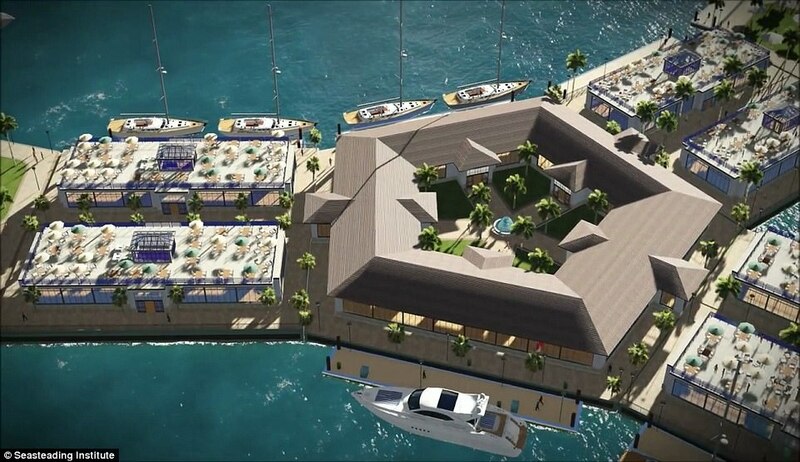 Mr Quirk and his team have now started a new company, Blue Frontiers, which will build and operate the floating islands in French Polynesia. 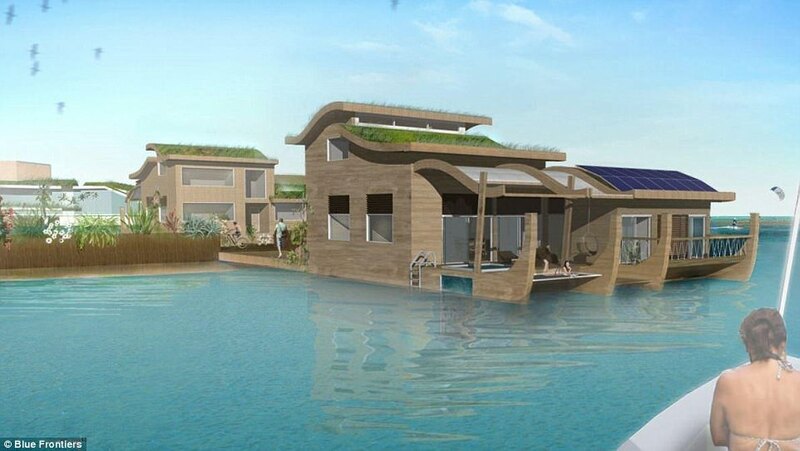 He said he was inspired to build a floating city, known as seasteading, when he went to the US festival Burning Man 2011. 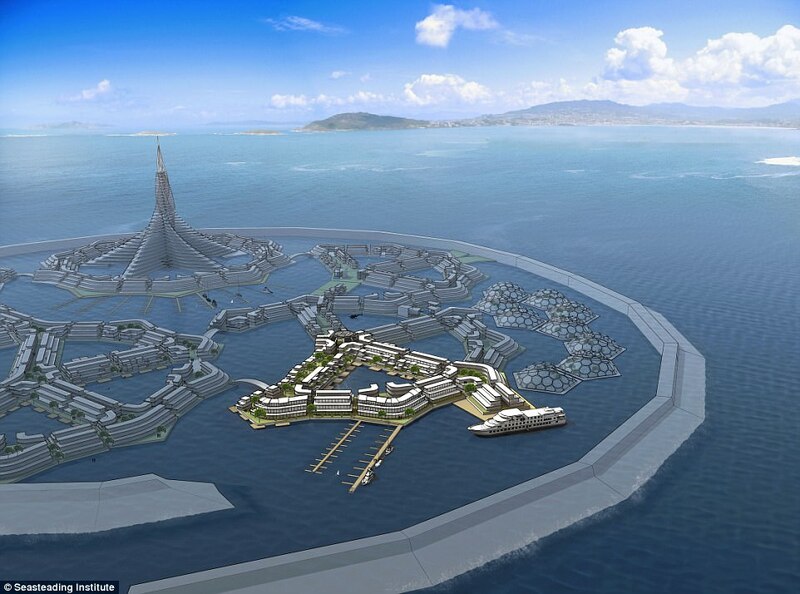 The groups claims that building floating cities is the first step to fulfilling 'the eight great moral imperatives'. 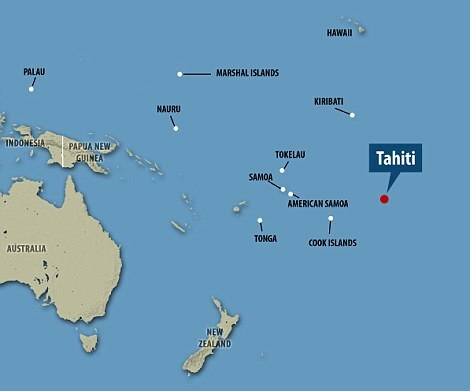 Its deal with French Polynesia, signed in January, specifies two points the project must prove before it gets the green light: Whether it will benefit the local economy, and if it proves to be environmentally friendly. 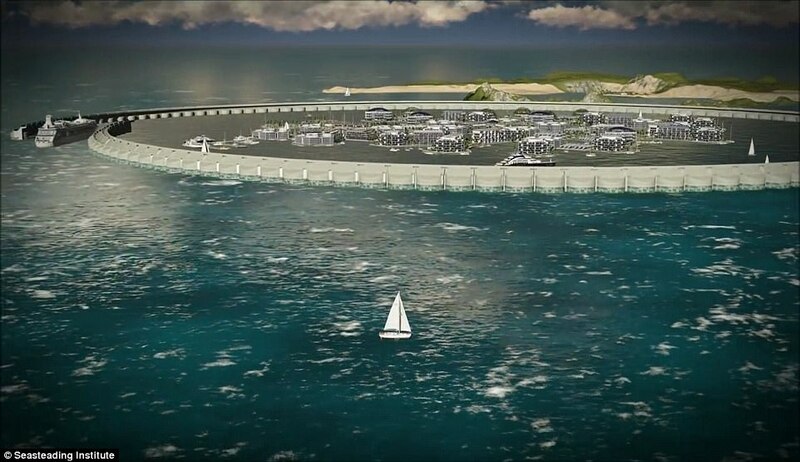 'We were looking for sheltered waters, we don't want to be out in the open ocean - it's technologically possible but economically outrageous to afford. 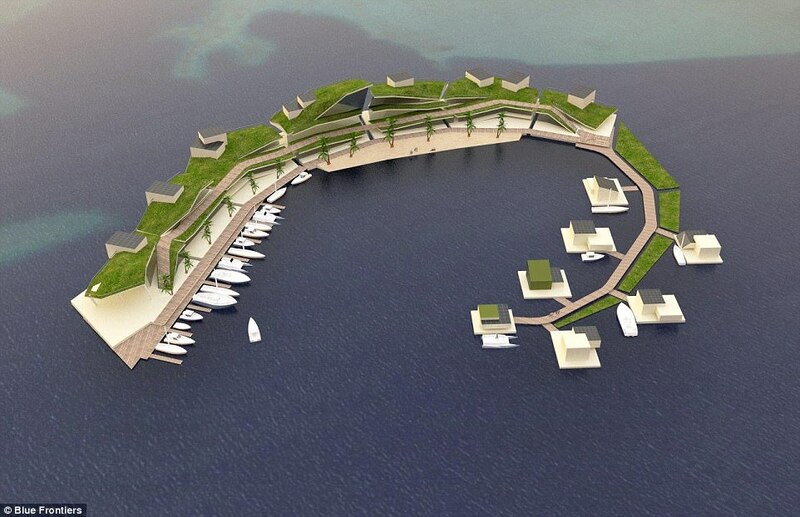 'If we can be behind a reef break, then we can design floating platforms that are sufficient for those waters at an affordable cost. 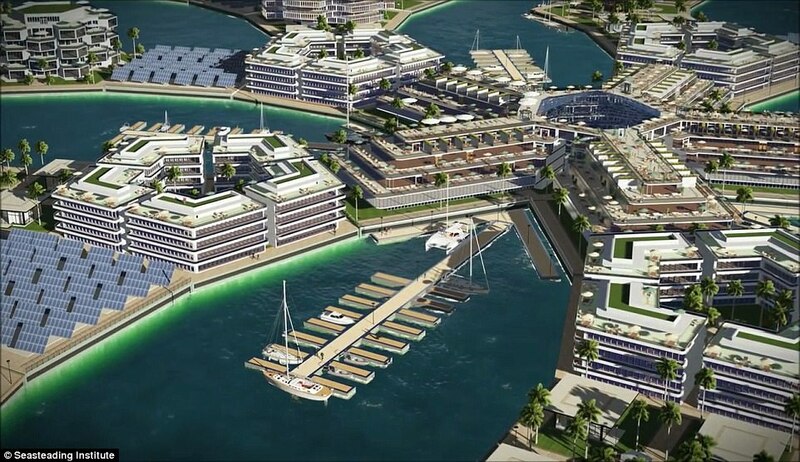 The plan is that the city will float just off-shore of a host nation, but have a substantial degree of political independence. The original proposal was to look to international waters to establish new nations, but the Institute realised locating its city off the coast would enable the inhabitants to go onshore and acquire goods, give it more shelter from storms and better legal protection.